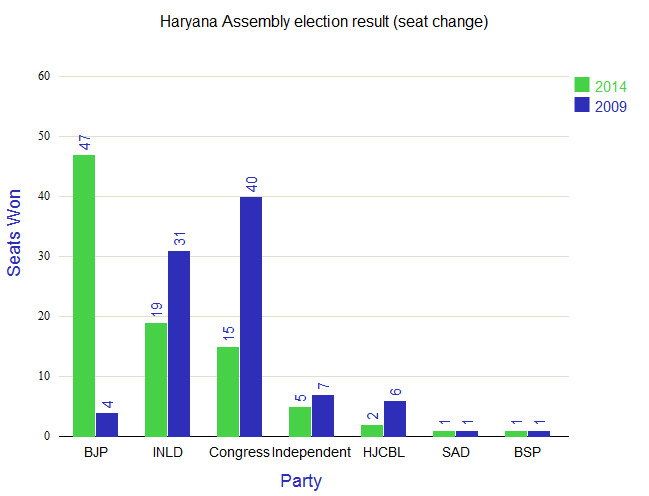 BJP won 47 seats out of 90 of Haryana assembly election. Indian National Lok Dal is the second-largest party with 19 seats. Congress is now at third place with 15 seats. Haryana Janhit Congress (BL) won 2 seats. BJP makes a huge gains of 43 seats compare to 2009 election. INLD lost 12 seats. Congress lost 25 seats and HJCBL lost 4 seat. BJP got 33.2% of total vote, 24.2% higher than 2009. Congress lost 14.5% vote. 0.4% voter has voted for NOTA.